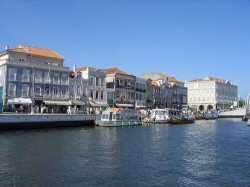 Aveiro has not earned its reputation as being the Venice of Portugal for nothing. The settlement that we know today as Aveiro once stood on the banks of a wide estuary, which slowly became blocked from the sea as a large spit of sandbanks formed at the estuary mouth — a clear result of the winds slowly blowing the sand up off the Atlantic shoreline. This created a large lagoon, which some time later the powers-that-be decided should be opened once more to the sea via a large canal, and thus the first step was taken in the formation of Aveiro’s distinctive canal system. These days, Aveiro canals criss-cross the entire city, radiating from the main Praça Humberto Delgado, which marks the heart of the city, and spreading out to the lagoon beyond. Perhaps to refer to Aveiro as “Venice” is stretching things a little, but there is no doubt that the tranquil waters, colourful houses and distinctive boats that punctuate the city lend it a unique charm and sense of magic that many other urban centres fail to capture. 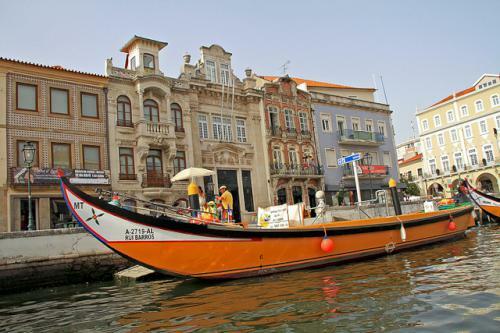 While it is perfectly possible to explore Aveiro on foot, it would be a shame to come to this delightful city and not take another perspective on it by enjoying a moliceiro trip – a ride in one of the distinctive boats that works the canals. 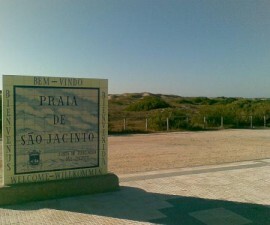 Moliceiros have played a pivotal role in the city’s history and economy for centuries, having originally been developed for the gathering of seaweed out in the lagoon. This is what earned them their low sides and high front and back, to make the gathering of seaweed easy. This was later used for fertiliser in the surrounding agricultural land. Nowadays, the brightly painted moliceiros with their ornate decorations are more commonly used for transporting tourists around the city, propelled by a pole, or punt. 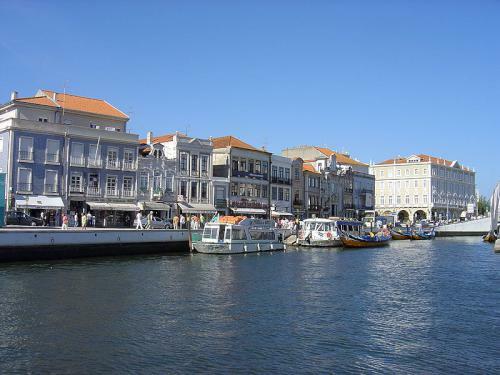 Joining a moliceiro trip for a tour around the city is the perfect way to spend a morning or afternoon in Aveiro. 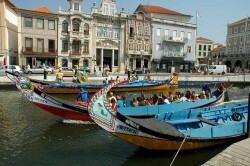 Your Aveiro boat trip will usually begin in the centre of the city, a few metres from the square on which the fish market is located. The market dates back many years, although its current building is relatively new and benefits from an attractive glass design which provides lovely views of the waters behind the traders selling their daily catch. This provides a real reminder of Aveiro’s marine agricultural heritage. There is also a restaurant called Mercado do Peixe that will leave you crying for more after you’ve tasted the wonderful fish and seafood delicacies typical of the region. 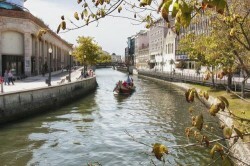 From here your moliceiro trip will weave you through the canals and waterways that radiate from the centre of the city. Lined with a mixture of former fishermen’s houses and grand buildings, many of which are built in faithful art nouveau style, the canals are a festival of colour. Brightly-coloured azulejos (hand-painted Portuguese ceramic tiles) jump out at every turn, cladding the impressive façades. 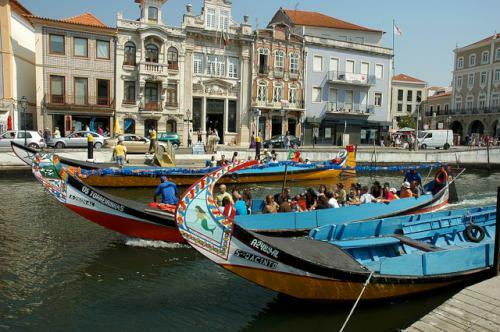 Depending on how much time you have, it is possible for your Aveiro boat trip to take you beyond the centre of the city, and if you can afford the time this is highly recommended. 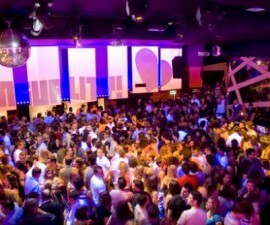 Leave the city centre, head out into the lagoon that flanks the northern banks of the city, and you will find yourself heading towards two of Aveiro’s notable attractions — Ilhavo to the west and Sao Jacinto to the north. Sao Jacinto is a protected Natural Reserve and is home to a wide variety of flora and fauna. It is particularly notable for its migratory birds, and visitors off season during the winter months will be treated to the best sightings. The area can be explored on foot, via a wooden boardwalk which flanks the dunes, or by boat, following the trails through the wetlands. Ilhavo offers some very different attractions, for this is the home of the Vista Alegre porcelain factory and a full day Aveiro boat trip itinerary will usually include a visit. 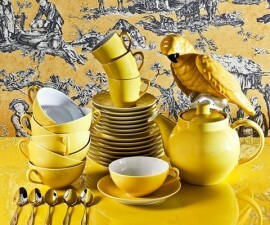 Vista Alegre is the most famous brand in Portugal for porcelain and indeed it is well known around the world for its distinctive designs and high quality porcelain and pottery pieces. A tour of the factory is a must, giving visitors the opportunity to watch the production process and learn a little more about the porcelain tradition in Portugal and the heritage of the Vista Alegre brand in particular. An on site gift shop makes the perfect place to purchase some mementos of your time here in Aveiro.